Lepakshi is a small village located in the Anantapur District, in Andhra Pradesh, India. It is 15 km east of Hindupur and about 120 km north of Bangalore. From Bangalore, it can be reached by going west at Kodikonda checkpost on Hyderabad highway NH7. Alternatively, one could take a bus or a train to Hindupur and then travel to Lepakshi. Lepakshi is very important historically and archaeologically. There are three shrines dedicated to Shiva, Vishnu and Virabhadra. The famous Veerabhadra temple, dedicated to Veerabhadra, is located here. Built by the brothers Viranna and Virupanna, the temple is a notable example of the Vijayanagar architectural style. It is famous for its sculptures, which were created by the artisans of Vijayanagara empire. 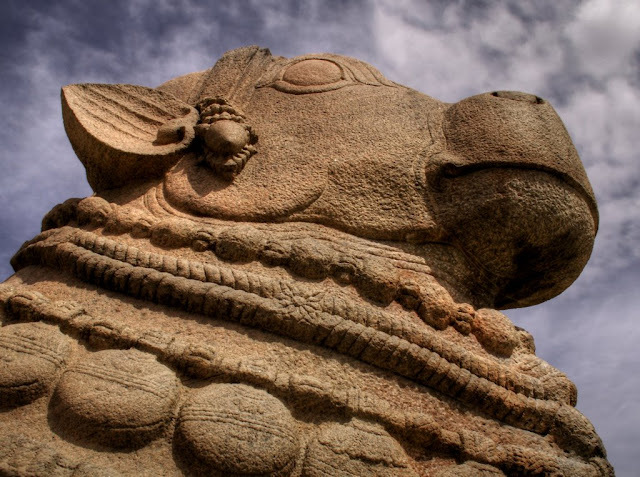 A huge Nandi bull made out of a single granite stone is one of the attractions in Lepakshi. The place is renowned for being one of the best repository of mural paintings of the Vijayanagar Kings. Legend has it that the Naga of the Nagalinga was carved out of a single stone by sculptors while they waited for their mother to prepare lunch. There are also ample stories floating in the air inside the temple walls about the divine couple Rama and Sita, and in fact, one of them relates to the suggested origin of the name Lepakshi. It is believed that when Ravana kidnapped Sita, the brave bird Jatayu fought against the evil king and died in the battle on this spot. As it lay wounded, its wings cut off by Ravana, Lord Rama said with compassion, “le pakshi” (rise, o bird!) – and so, Lepakshi. Look out for the imprint of the giant footprint just outside the kalyanamantapa, believed to have been left by Sita herself! The other and equally gory story about the name points to the brothers Veeranna and Virupanna, under King Achutaraya of the Vijayanagara dynasty. The latter who was treasurer of Penukonda province (today’s Anantpur) spared no expense to have the temple built the way he wished as a tribute to the Lord, as his mute son regained his speech after playing near the Udbhava moorthy of Shiva which was on this hillock, leading to suspicions from the king about embezzlement of money. In grief and in anticipation of royal punishment, Virupanna plucked out his own eyes and threw them against the wall, where the muted blood stains from centuries ago are believed to be visible even today. (By the way, the Government had these stains tested and has confirmed that they are indeed blood stains which refuse to be erased despite several tries!) And thus, lepa-akshi (blinded eyes). There are three temples dedicated to Shiva, Vishnu and Virabhadra. On a hillock known as Kurma Saila (tortoise shaped hill), temples of 'Papanatheswara', 'Raghunatha', 'Srirama', 'Veerabhadra' and 'Durga' are located. Veerabharadra temple is the most important temple. Lepakshi is an ultimate testimony for Vishwakarma Brahmins who sculpted these temples. It is believed that noted Vishwakarma Amarashilpi Jakkanachari took part in the planning the architecture of these temples. There are many shila shasanas that the famous sculptors like Dakoju, Maroju took part in this temple sculpture. Veerabhadra temple is a notable example of the Vijayanagar style of architecture. A reference is made in the 'Skandapurana' to Lepakshi as one of the hundred and eight important 'Shaiva Kshetras' (shrines). Though the temple of Veerabhadra is claimed to have been constructed by Saint 'Agastya' himself, it was developed into the present exquisite shrine by 'Virupanna', the treasurer of the Vijayanagar Kings. The temple at Lepakshi has several characteristics that are unique to the Vijayanagara style of architecture – the most striking being giant monoliths; in Lepakshi the Nagalinga and the Nandi are both the largest such statues (other monoliths from the period being the Ganesha temples at Hampi and the Gomateshwara statue at Karkala). You enter the temple at the Mukhyamantapa (main hall) directly into the natyamantapa (dancing hall) that is at the centre of the building and leads into the Garbagruha or the sanctum. This hall has pillars depicting divine musicians, Parvati dancing, Brahma on the cymbals and Surya on the nadaswaram and finally, Nataraja himself, leg raised in the classical nartana position. Walking along the side of the temple on the outer prahara, you then come to the giant statue of the seven-headed cobra Nagalinga and further down, Ganesha etched into the wall. This walk leads to the other important structure within the building, also an essential element of Vijayanagara architecture, the open-air Kalyanamantapa (wedding hall). This Kalyanamantapa has been depicted as the site of the celestial wedding between Shiva and Parvati, and each of the pillars is a celebration of this – drummers and musicians adding to the atmosphere and lesser gods and goddesses blessing the couple. Close by stands the Latamantapa, with its 42 pillars, each carved with intricate motifs of birds and flowers, used to this day as designs on sari borders, and the reason why AP handicrafts chose this name. At the Natyamantapa look up to find the most fascinating feature of the temple, the murals that adorn the ceiling. Although a lot of it has now been eroded by the harshness of time and neglect, the vibrant colors of natural vegetable and flower dyes still catch the eye of the visitor. Each of them depicts a story from mythology. 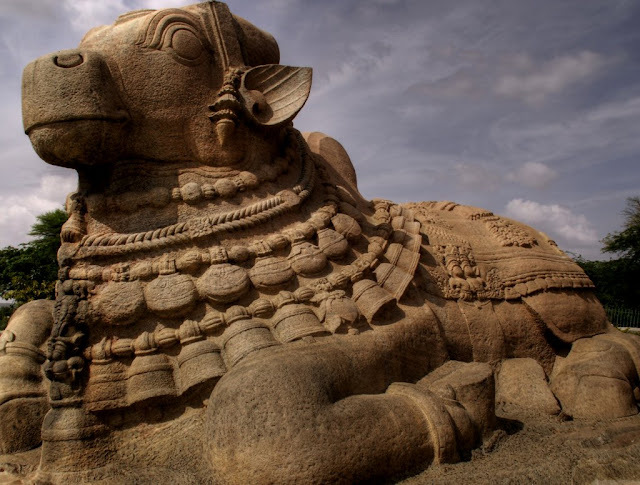 Half a kilometer from the temple, just by the road stands the statue of Nandi carved from red granite. It is 15 feet tall and 27 feet long. Yet for all its imposing size, the carving is intricate, especially the bells around the neck bearing the royal insignia of the Vijayanagara dynasty. And just like with Hampi, each stone, each pillar and wall has a story to tell, if only you have the time and patience to listen carefully. The temple here is built on a tortoise shaped hillock – kurmashaila; between all the straight lines and sharp angles of the walls and pillars, there is a smooth rounded rock (the back of the tortoise) in the outer prahara. Kartikeya Immediately inside the Kalyana Mandapa is an exquisite Karthikeya image sculpted on a wide pier. The diety is depicted with six heads and ten arms, and is framed by pilasters and a makara-torana canopy. Ganesha Shrine This painted image of Ganesa has been carved into the side of a boulder. A separate mandapam with sculpted pillars and colonnettes, encloses the image. Nagalingesvara Carved out of a natural boulder to the west of the shrine, this seven-hooded Naga shelters a black-polished lingam cradled in its ribbed coils. A saptamatrika panel is placed below to the right. There are many specialities in this temple like rock chain, Vastu Purush, Padmini race Lady, Hanging Pillar , Durga Paadam, Lapakshi saree designs etc. On the walls of this temple, there are several stories like mahabhaaratha, ramayana etc are sculpted. Also on the roof there are so many beautiful paitings done by natural colour mixtures. One more famous spot in this temple is "Eyes of Viroopaakshanna". As the history says, Due to king's misunderstanding with this temple builder, king ordered to make him blind. Hearing this the builder plucked his own eyes and throw at this temple walls. Till date one can find those blood scars on that particular wall.